Alternative Gift Fair, Sun., Nov. 17, 2019, noon-2:30 p.m., Activities Center (504 Oakland Ave.), lunch, auction, crafts. A yearly event held in late Nov. to encourage purchasing Christmas gifts that will benefit people served by OAPC's mission ministries. Alternative Gift Fair Catalog -- Simplify your Christmas giving and honor a loved one by supporting our Mission Partners, who reach out to care for our community and others throughout the world. interdenominational hot meal lunch program Mon.-Sat. 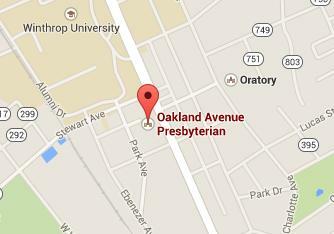 OAPC serves on 3rd Tuesdays and 5th Saturdays. Helping Other People Effectively ministers to those in need by providing groceries and partial payments for utilities and medicines. National Alliance for the Mentally Ill is an education and advocay group for people with brain disorders. Support Groups meet on the 2nd & 4th Tuesdays at 6:15 p.m. in rooms 202/203; an open Education Meeting meets quarterly at 7:30 p.m. on the 2nd Tuesday of March, June, Sept. and Dec. in Fellowship Hall. counseling services for a variety of needs such as for the emotionally troubled, families, and clergy training. NAMI (National Alliance on Mental Illness) -- General Educ. meetings are held quarterly (March/June/Sept./Dec.) 2nd Tuesdays at 7:30 p.m., Fellowship Hall; Connections and Family Support groups meet 2nd and 4th Tuesdays, 6:15 p.m., room 202 education wing; family classes meet when scheduled.